It’s worst to see, imagine and absorb the fact that more than 50 percent of Indians still defecate in open and that was the reason that inspired Akshay Kumar to make ‘Toilet Ek Prem Katha’. But the movie is not bad-at-all as the fact. Instead, it mirrors a reality, shuns superstition, hits where it hurts through brilliant dialogue (as said by Taran Adarsh). 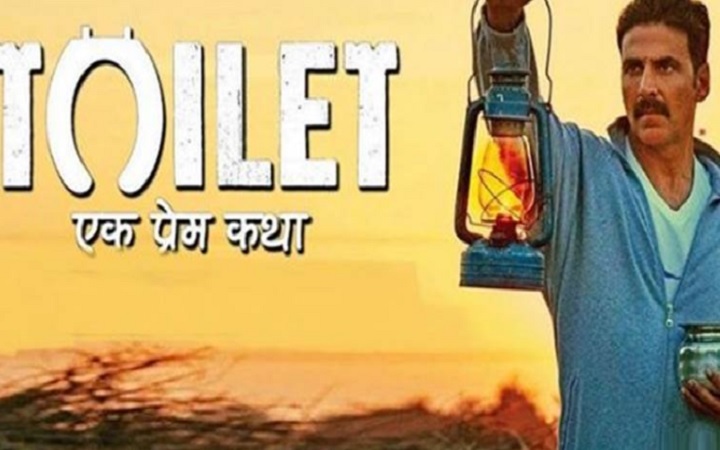 Akshay Kumar’s new film ‘Toilet-Ek Prem Katha’, emphasizes the importance of constructing toilets and the way it delivers the message is absolutely commendable. Toilet Ek Prem Katha is getting overwhelming response across all over the country. On the first day of its release, the box office collection soars high as expected. Hollywood actress Salma Hayak has given her best wishes to Akshay Kumar’s recently released film ‘Toilet Ek Prem Katha’. Salma (50) wrote on the tweet: “Good luck to Akshay Kumar for the film that was made on the toilet and is on display today. Now open defecation should be stopped. Women should not be afraid to go to the toilet. “For the Global Teachers Prize 2016, last year Akshay met Salma in Dubai and thanked the actress for supporting this campaign. He wrote, “Thank you for giving your love to the ‘Toilet Ek Prem Katha’, like our small effort.” ‘Toilet: Ek Prem Katha’ has been directed by Shri Narayan Singh and it is produced by Viacom18 Motion Pictures. On the backdrop of the Swachh Bharat Abhiyan, the film will also see Bhoomi Pednekar and Anupam Kher.